Married Name Her married name was Whiteside. Name Variation Allie C. Head was also known as Alice. Allie C. Head married Henry L. Whiteside. Allie C. Head was born on 26 February 1890 at Arkansas. She was the daughter of Harvey Whitfield Head and Lydia Irene Arnold. Allie C. Head died on 5 January 1942 at age 51. [S245] U.S. Federal Census 1900 U.S. Federal Census, by Ancestry.com, ED26. Dwelling 431. [S204] California Death Records (published), listed mother's maiden name for Frank Miller Sallady. William Weir married Mary Ann McGovney in 1851 at Adams, Ohio. William Weir was buried in 1872 at Miami, Kansas. He died in 1872 at Louisburg, Miami, Kansas. Married Name 1851 As of 1851,her married name was Weir. Mary Ann McGovney was buried at Louisburg, Miami, Kansas. She was born on 8 October 1826 at Adams, Ohio. She married William Weir in 1851 at Adams, Ohio. Mary Ann McGovney died on 4 August 1904 at Yates Center, Kansas, at age 77. She was buried after 4 August 1904 at Miami, Kansas. [S246] U.S. Federal Census 1880 U.S. Federal Census, by Ancestry.com, NA Film Number T9-0389 Sheet 510A. James Weir was the son of William Weir and Mary Ann McGovney. Jane Weir was the daughter of William Weir and Mary Ann McGovney. Rebecca Weir was the daughter of William Weir and Mary Ann McGovney. Rebecca Weir was buried at Miami, Kansas. Name Variation Elizabeth Weir was also known as Lizzie. Elizabeth Weir married John T. Bradley. Elizabeth Weir was born on 27 January 1853 at Ohio. She was the daughter of William Weir and Mary Ann McGovney. Elizabeth Weir died on 12 March 1939 at age 86. [S246] U.S. Federal Census 1880 U.S. Federal Census, by Ancestry.com, NA Film Number T9-0389 Page Number 506B. Sarah Weir was born in 1854. Andrew Weir was born in 1856. He was the son of William Weir and Mary Ann McGovney. Margaret Weir was born in 1857. William Henry Weir was born in 1861. Mary Evelyn Weir was born in 1864 at Minnesota. Married Name Her married name was Reed. She was buried at Miami, Kansas. She was born in 1866 at Ohio. Fred Weir was born circa 1869 at Minnesota. John T. Bradley married Elizabeth Weir, daughter of William Weir and Mary Ann McGovney. John T. Bradley was born on 15 August 1845 at Kentucky. Edwin M. Fitzroy was born circa 1890 at South Dakota. He married Florence B. Latham circa 1929. [S250] U.S. Federal Census 1930 U.S. Federal Census, by Ancestry.com, ED84-18. Dwelling 8. [S204] California Death Records (published), listed in death index for Edith C Crotchett. Ludwig Diehl was born on 15 February 1829 at Burbach, North Rhine-Westphalia, Prussia. He was the son of John Phillip Diehl and Anna Elizabeth Haas. Ludwig Diehl married Caroline Fey, daughter of Johan Adam Fey and Anna Thomas, before August 1860. Ludwig Diehl died on 15 April 1886 at Troy, Sauk, Wisconsin, at age 57 age 57y 2m. [S248] U.S. Federal Census 1860 U.S. Federal Census, by Ancestry.com, Page 110. Handwritten page 856. Dwelling 847. [S247] U.S. Federal Census 1870 U.S. Federal Census, by Ancestry.com, Page 15-16. Stamp 263. Dwelling 106. [S246] U.S. Federal Census 1880 U.S. Federal Census, by Ancestry.com, NA Film Number T9-1446 Page Number 251D. Herbert Edwin Diehl was born on 1 December 1883 at Wisconsin. He was the son of Ludwig Diehl and Caroline Fey. Herbert Edwin Diehl died on 28 December 1932 at age 49. [S245] U.S. Federal Census 1900 U.S. Federal Census, by Ancestry.com, ED145. Dwelling 277. Name Variation Mary Polly McGann was also known as Polly. Married Name 13 December 1838 As of 13 December 1838,her married name was Gallop. Mary Polly McGann was born circa 1821 at Canada. She was the daughter of Henry McGann and Elizabeth (?). Mary Polly McGann married Benjamin Gallop, son of Benjamin Gallop and Charlotte Winchell, on 13 December 1838 at Whitby, Ontario, Canada, by Rev. Israel MARSH in the presence of James DAVISON and Sophia SAILS. Mary Polly McGann died before 1900. [S249] U.S. Federal Census 1850 U.S. Federal Census, by Ancestry.com, Stamp 436. Dwelling 2392. [S248] U.S. Federal Census 1860 U.S. Federal Census, by Ancestry.com, Page 47. Dwelling 346. [S247] U.S. Federal Census 1870 U.S. Federal Census, by Ancestry.com, Page 3. Dwelling 17. [S246] U.S. Federal Census 1880 U.S. Federal Census, by Ancestry.com, ED261. Page 4. Dwelling 26. Name Variation William Henry Nickey was also known as Will. William Henry Nickey was born in June 1853 at Wisconsin. He was the son of Abraham Nickey and Margareta Eve Kiefer. William Henry Nickey was listed as a beneficiary in Abraham Nickey's will on 11 October 1872 at Sauk, Wisconsin. William Henry Nickey married Fannie E. DeVor, daughter of John D. DeVor and Cornelia M. (? ), circa 1889. William Henry Nickey was buried in 1910 at Forest Home Cemetery, Milwaukee, Milwaukee, Wisconsin. State: WI between 1889 and 1890 at Milwaukee, Milwaukee, Wisconsin. [S248] U.S. Federal Census 1860 U.S. Federal Census, by Ancestry.com, Dwelling 952. Page 126. [S247] U.S. Federal Census 1870 U.S. Federal Census, by Ancestry.com, Dwelling 71. Page 11. Stamp 233. [S246] U.S. Federal Census 1880 U.S. Federal Census, by Ancestry.com, NA Film Number T9-0803 Page Number 323A. [S245] U.S. Federal Census 1900 U.S. Federal Census, by Ancestry.com, ED145. Dwelling 54. Name Variation Jerome J. Nickey was also known as J. J.
Jerome J. Nickey was born circa 1848 at Ohio. Jerome J. Nickey married Margaret M. Evans, daughter of Evan D. Evans and Jane Morgan Newgate, on 13 March 1869. Jerome J. Nickey was listed as a beneficiary in Abraham Nickey's will on 11 October 1872 at Sauk, Wisconsin. 13 June 1895 Minneapolis Ward 11, Hennepin, Minnesota He appeared on the census of 13 June 1895 at Minneapolis Ward 11, Hennepin, Minnesota. Enlisted in Company E, 47th Infantry Regiment Wisconsin on 27 January 1865. Mustered out Company E, 47th Infantry Regiment Wisconsin on 04 September 1865 in Nashville, TN. [S180] Wisconsin Sauk Co Cemetery Records Vol 6, page 85. [S249] U.S. Federal Census 1850 U.S. Federal Census, by Ancestry.com, Stamp 434. Dwelling 1175. [S247] U.S. Federal Census 1870 U.S. Federal Census, by Ancestry.com, Dwelling 74. [S246] U.S. Federal Census 1880 U.S. Federal Census, by Ancestry.com, NA Film Number T9-1446 Page Number 234D. Name Variation George Gilbert Nickey was also known as Gilbert R.
George Gilbert Nickey was born in July 1849 at Ohio also reported as July 1850. George Gilbert Nickey was listed as a beneficiary in Abraham Nickey's will on 11 October 1872 at Sauk, Wisconsin. As of 1905, George Gilbert Nickey was never married. He was buried in 1929 at Forest Home Cemetery, Milwaukee, Milwaukee, Wisconsin. 1 June 1905 Milwaukee, Milwaukee, Wisconsin George Gilbert Nickey is listed as son on the census of 1 June 1905 in the household of Margareta Eve Kiefer at Milwaukee, Milwaukee, Wisconsin. [S247] U.S. Federal Census 1870 U.S. Federal Census, by Ancestry.com, page 9. Dwelling 71. [S245] U.S. Federal Census 1900 U.S. Federal Census, by Ancestry.com, ED145. Dwelling 7. Married Name 11 March 1846 As of 11 March 1846,her married name was Cass. Julia (?) was born on 18 August 1827 at Quebec, Canada. She married Dr. Osman Cass, son of Simon Cass II and Rhoda Wallace, on 11 March 1846. Julia (?) died on 6 June 1846 at age 18. 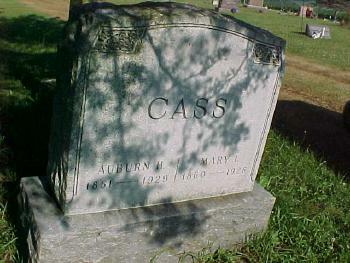 Married Name before 1856 As of before 1856,her married name was Cass. Harriet Hicks was born on 8 June 1830 at Canada. She married Dr. Osman Cass, son of Simon Cass II and Rhoda Wallace, before 1856. 1880 Ithaca, Richland, Wisconsin Harriet Hicks was listed as wife in Dr. Osman Cass's household on the 1880 Census at Ithaca, Richland, Wisconsin. [S248] U.S. Federal Census 1860 U.S. Federal Census, by Ancestry.com, Dwelling 555. Page 60. [S247] U.S. Federal Census 1870 U.S. Federal Census, by Ancestry.com, Page 17. Dwelling 127. Emma Cass was born circa 1856 at Wisconsin. She was the daughter of Dr. Osman Cass and Harriet Hicks. Ella Cass was born circa 1860 at Wisconsin. 1880 Ithaca, Richland, Wisconsin Ella Cass was listed as a daughter in Dr. Osman Cass's household on the 1880 Census at Ithaca, Richland, Wisconsin. Married Name 28 May 1882 As of 28 May 1882,her married name was Dow. Lydia Cass was born circa 1864 at Wisconsin. Lydia Cass married Roland Ralph Dow, son of (?) Dow and Harriet (? ), on 28 May 1882 at Richland Center, Richland, Wisconsin. 1880 Ithaca, Richland, Wisconsin Lydia Cass was listed as a daughter in Dr. Osman Cass's household on the 1880 Census at Ithaca, Richland, Wisconsin. Mary Iola Cass was born on 10 May 1860 at Wisconsin. She was the daughter of George Washington Cass and Margaret Jane Beaver. Mary Iola Cass married Auburn H. Cass, son of John Colby Cass and Lestina B. Davis, on 9 March 1880. Mary Iola Cass was buried in 1926 at Willow Valley Cemetery, Ithaca, Richland, Wisconsin. Mary Iola Cass had zero children. [S247] U.S. Federal Census 1870 U.S. Federal Census, by Ancestry.com, Page 1. Stamp 639. Dwelling 3. [S246] U.S. Federal Census 1880 U.S. Federal Census, by Ancestry.com, NA Film Number T9-1445 Page Number 101D. [S245] U.S. Federal Census 1900 U.S. Federal Census, by Ancestry.com, ED110. Dwelling 29. [S244] U.S. Federal Census 1910 U.S. Federal Census, by Ancestry.com, ED99. Dwelling 188.